The nights are getting darker, the air is feeling cool and once again I've dug my jumpers out from the back of my wardrobe. Winter time is definitely approaching and to me, that can only mean one thing - it's officially hot chocolate season! For a rather long time now I've been wanting to take on the challenge of discovering where to find the best hot chocolate in the North East so this year I decided to finally go for it and have spent the last three months charging my way round a lot of places sampling mugs of chocolate. You may think that finding the best hot chocolate is easy but let me tell you, it really isn't. When I think about the perfect hot chocolate it needs to be thick and indulgent, creamy and really chocolatey - of course if it comes completely covered in ridiculous toppings that's a bonus! So here we finally are, my guide to where to find the best hot chocolate in the North East, and yes I sampled every single one of these beautiful treats myself! As soon as we tried the hot chocolate from Proven Goods Co in Hoult's Yard (£3.80) I almost decided there and then to call the search off. They are incredible! Topped with homemade freshly toasted marshmallow fluff and proper chocolate shavings - battling through the delicious gooey marshmallow to get to the rich hot chocolate underneath is a moment to truly be savoured. Of course you also have to have a doughnut on the side so make sure you turn up hungry! Perhaps the most perfect location in the North East for a hot chocolate, Love Lily is the cutest little tea room opposite Roker Beach in Sunderland. A brisk Winter's walk along the seafront followed by a hot cup of chocolate is the best way to spend an afternoon! They have an impressive hot chocolate menu with lots of flavours to choose from and each cup is made with liquid chocolate and lovingly created to perfection to ensure a really smooth drink. The Black Forest (£4.20) uses Dark Hot Chocolate with Cherry Syrup, Cream and Chocolate Sauce that's so generous it oozes down the handle and ends up all over your hands - delicious! There are two Hotel Chocolat stores in the North East where you can enjoy their special hot chocolates - a sit down cafe at Teesside Park and a takeout counter at The Bridges in Sunderland. No syrups, no powder just pure chocolte - the hot chocolate comes 50% milky, 70% dark, 85% dark or 100% dark or, if you prefer salted caramel, hazelnut, chilli, mint or vanilla white. Personally I love the salted caramel (£3.50) and if you order the Cacao Whip and Supermilk Shard on the side for an extra 50p you're really onto a winner. This was the hot chocolate that had all eyes on me as it made its way over to my table and who can blame them - that is one impressively large mountain of cream going on there! 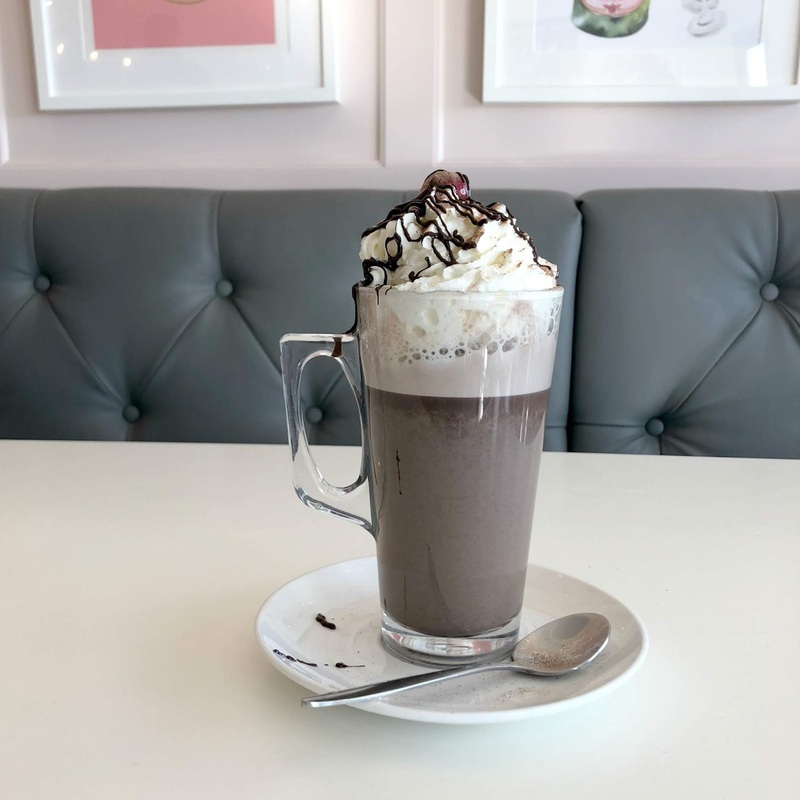 The Extra Special Hot Chocolate (£3.60) at Cake Stories in Jesmond is made with real melted milk chocolate drops steamed with milk and comes topped with vanilla whipped cream and salted caramel sauce. The real challenge for me was not to order half of the cake counter to go with it! Consett is a bit of a drive from our house but the hot chocolates at Maddisons are enough to make us jump in the car and travel down to County Durham for our fix. The daily home blended hot chocolate is created using delicious Belgian Chocolate and the Hot Chocolate With Everything (£3.50) comes with a very generous helping of freshly whipped Vanilla Cream with the most incredible homemade marshamallow on the side. Easily one of the best hot chocolates in the North East - you need to try this bad boy! 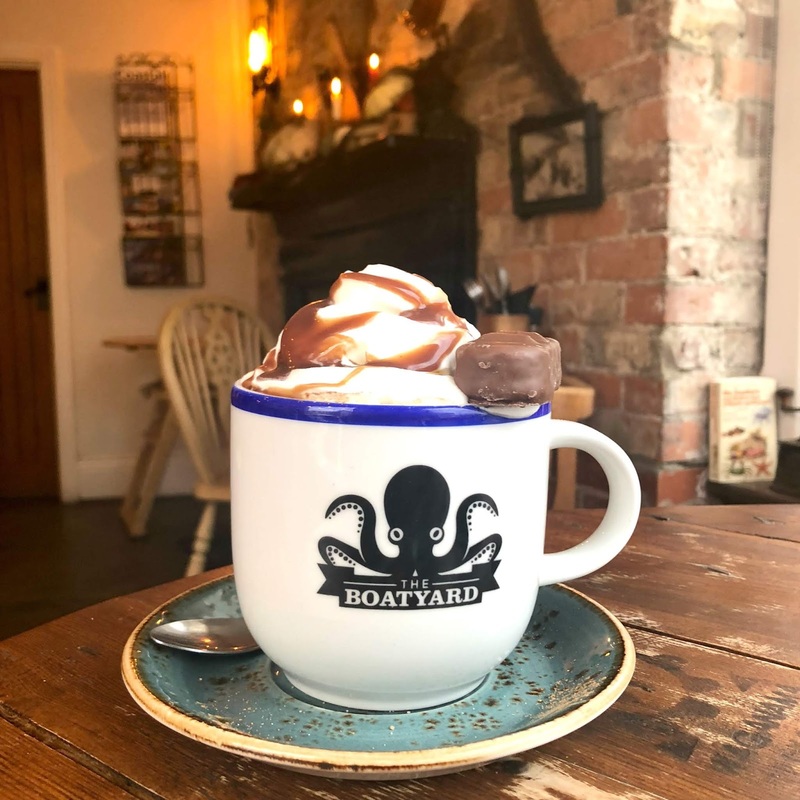 Out of all the hot chocolates I shared on my Instagram during my mission to find the best hot chocolate in the North East, this one at The Boatyard got the most likes and it's easy to see why, it's an absolute beauty! The Bounty (£3.75) is what I like to describe as a big hot mess - Hot Chocolate flavoured with a sweet coconut syrup and topped with cream, sticky sauce with a cheeky little Bounty on the side. It's a real sugar kick and the one to go for if you have a sweet tooth. It's also worth noting that after our visit a lot of people contacted me to say that they also do an awesome vegan Hot Chocolate! 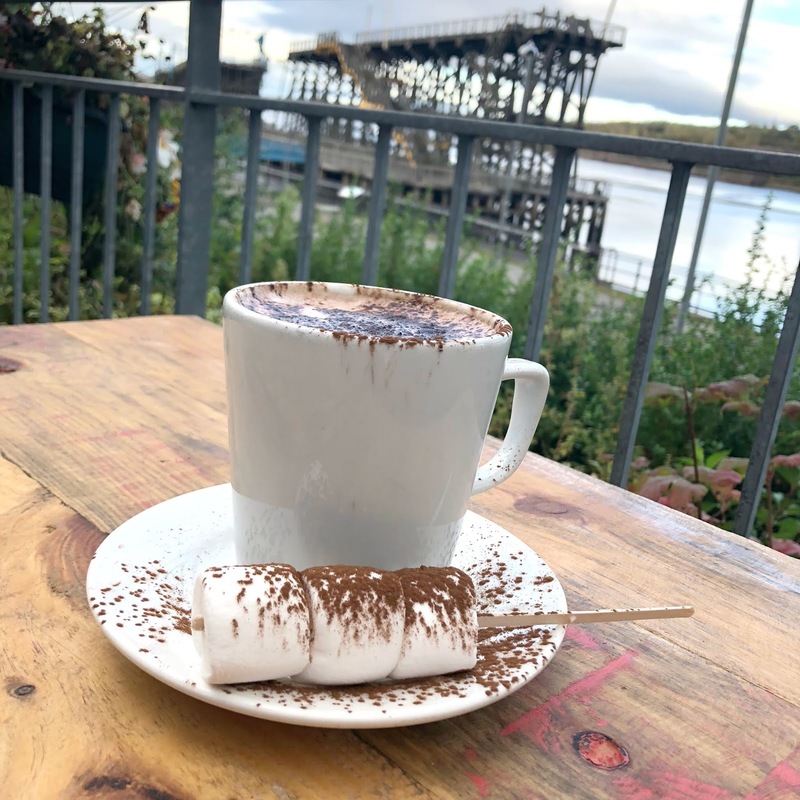 If you're going for an alfresco hot chocolate this Autumn then I highly recommend an outside table overlooking the Tyne at the Staithes Cafe. Their Hot Chocolate of the Month (£2.60) offers something different each time. Forever dreaming up new ideas, the October special featured this rather handy marshmallow kebab, ideal for dunking and stirring. Just make sure you get there early if you're visiting at the weekend, the queues for a table are pretty epic! Anywhere that serves me hot chocolate with some added cake is going to win its way into my heart pretty easily. 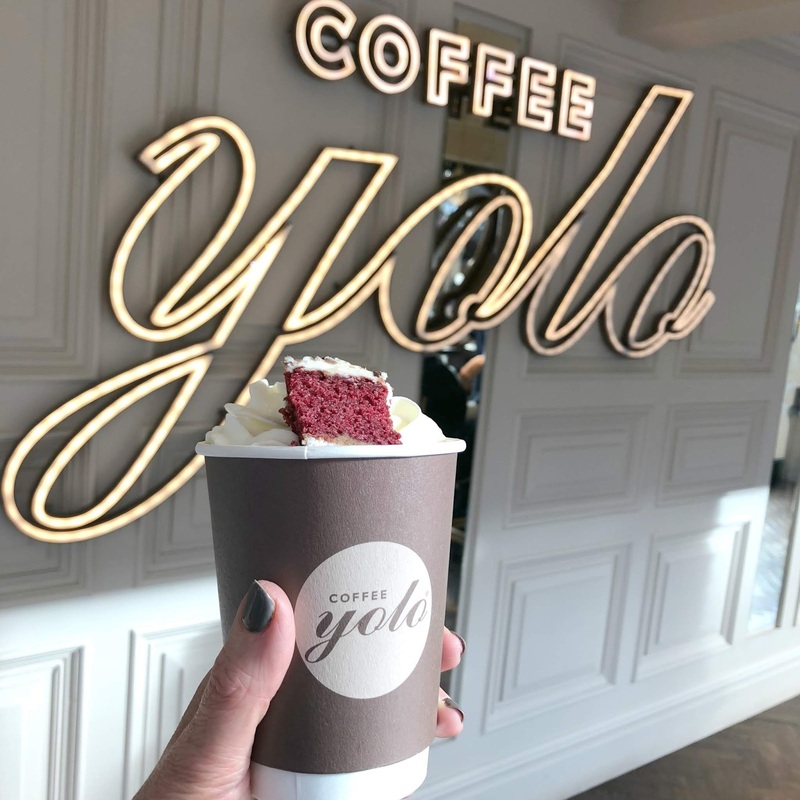 The Red Velvet Hot Chocolate (£2.95) at Yolo Coffee in Stack is just one of the special twists that they do on a classic hot chocolate. White Hot Chocolate served with a secret extra something, a huge mountain of cream and a chunk of red velvet cake is the ultimate indulgent treat. There's limited seating inside so this one is the treat to grab and go! The Deluxe Hot Chocolate (£3.50) at Cafe 1901 in Gosforth is topped with a candy covered mountain of cream and once you dig your spoon in you realise that it just keeps going and going until you eventually hit the pile of marshmallows that have begun to melt into the liquid chocolate below. So good! The hot chocolate is made using Dark Single Origin 70% and is absolutely delicious and perfect as a Winter treat. This was the hot chocolate that came with a beautiful view and no spoon (yes, I had to face dunk into my cream despite the fact I was sat next to a stranger!) A few people told me that the Hot Chocolate (£3.00) at Cafe W in Waterstones was worth a try. I had it fully loaded with cream and marshmallows and I have to say it was one of the loveliest I had mostly due to the peaceful surroundings and gorgeous views of the city. I soon realised when I was researching this blog post that there are a lot of places in the North East that do amazing hot chocolates. My list of places to try is still pretty long but, I thought that I'd best publish this now otherwise we'll hit the Summer and I'll still be going! After all of that you're probably wondering which was my favourite and where to find THE best hot chocolate in the North East. 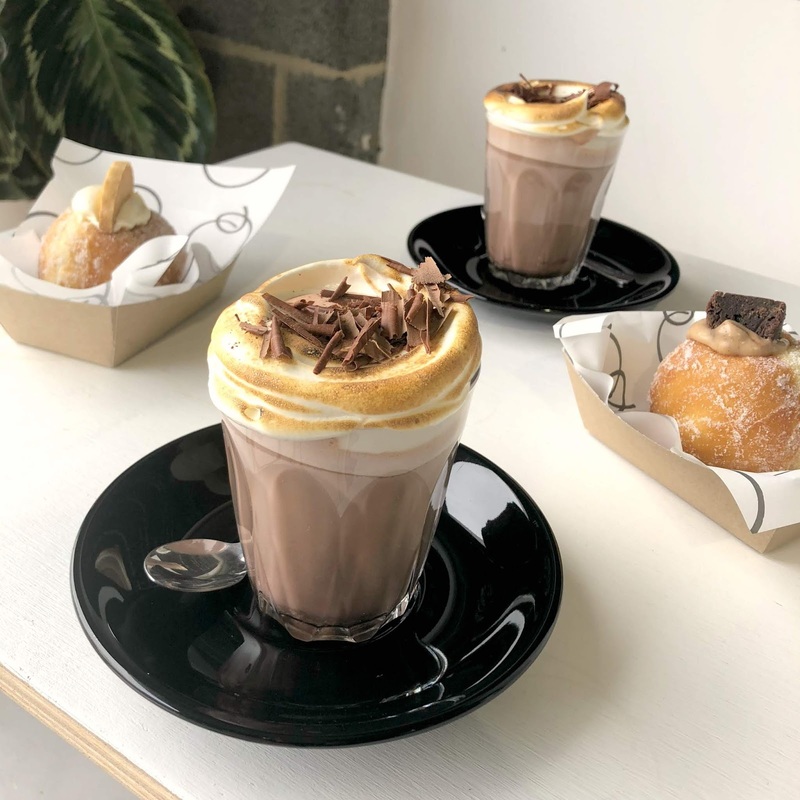 The answer was actually discovered right at the very beginning, Proven Goods Co in Hoult's Yard in Newcastle have attracted an army of very loyal hot chocolate fans who have all gone crazy for their marshmallow fluff topped drinks and believe me it is worth the hype! They are definitely the best hot chocolate in the North East. Maybe next Winter I'll do a part two because believe me I have enough places I still want to try. In the meantime make sure you let me know your favourite hot chocolate discoveries and where you think I should try next! That proven goods one sounds dreamy. So does the Black Forest one. I can’t believe there are 2 hotel choc ones now and none near me! I know ... surely they must open one in Newcastle one day?!! OMG the Proven hot chocs are amazing, I think some people now visit them just for the hot chocolates! What a lovely range of hot chocolates and places to have them - so many places I haven’t tried in Newcastle. Never tried a proven doughnut so will have to go at some point when we get a car. What a great post! OMG you have to go! I think it'd actually be quite a nice walk from the Quayside! Gone are the days of cheap instant hot chocolate eh? All of these look glorious!! I know! Argh there's nothing more disappointing than going somewhere for a hot chocolate and being served up some watery rubbish! I think a lot of people loved the look of that one! My eyes were on stalks when it came over! Never heard of proven goods co or hoults yard, need to check this place out! Oh wow you're in for a treat, their doughnuts are absolutely incredible! Go hungry so you can have a doughnut with a hot chocolate! Seriously considering seeing if I can drag my husband and kids out of bed on Saturday morning, to get down to Proven Goods early for Hot Chocolate and doughnuts. Although, I suspect they may be very busy this weekend, following your glowing review! OMG yes do it! Definitely worth getting up and out early for, if you get there for opening you'll get your pick of the tables. They always sell out of doughnuts by lunchtime because they are so popular! I *think* I have persuaded him. So excited! Oooooh yes, their Harry Potter treats look lovely, so excited to see what they have up their sleeves for Christmas too! I've been so excited for this post! These all look amazing, to me this is just the perfect time of year for a hot chocolate. I need to go to Proven Goods Co ASAP! And I honestly didn't even know that Hotel Chocolat did hot chocolate! Yes, you need to go and visit Proven, they are absolutely incredible and you can have a cheeky doughnut on the side! This post makes me want to cry. These all look so amazing that I'm sad I don't live closer! Research for this post must have been tough ;) haha! 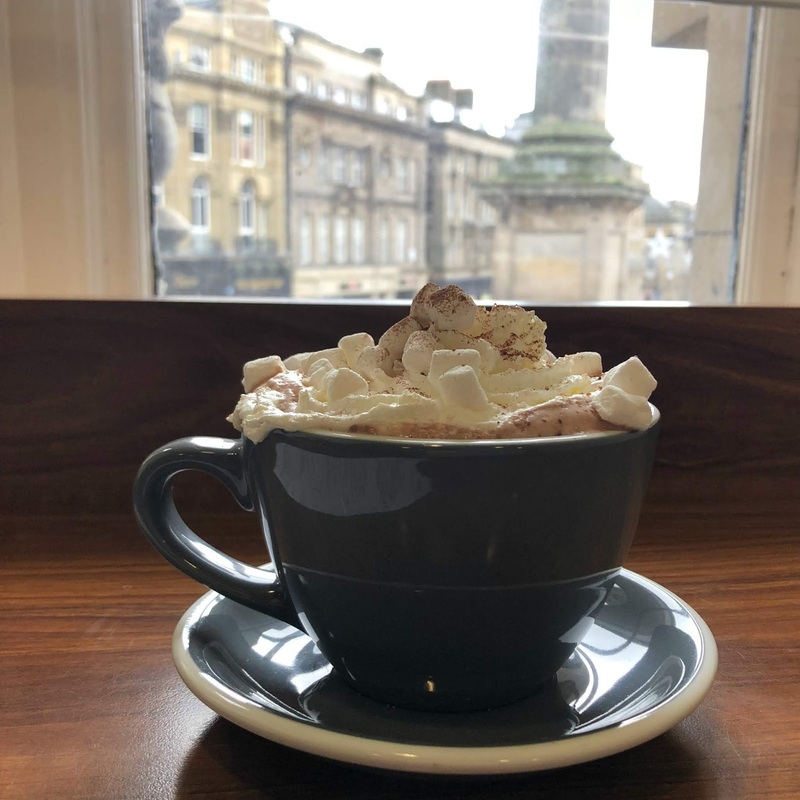 Ahhh you'll just have to come up for a visit - I feel like Newcastle Hot Chocolate Weekends should definitely be a thing!